CHICAGO (May 12, 2011) – Trust in America’s financial system has stumbled to 20 percent from 26 percent, according to the Chicago Booth/Kellogg School Financial Trust Index. The latest report shows that Americans’ overall trust has fallen to levels recorded during the earliest months of the financial meltdown (20 percent in December 2008 and 19 percent in March 2009). A possible explanation for this fall in trust is that the survey was conducted shortly after the Fukushima Daiichi nuclear plant disaster in Japan. Also, the survey authors believe that Japan’s recent earthquake and drastic stock market drop might have affected Americans’ level of financial trust. The Chicago Booth/Kellogg School Financial Trust Index is a quarterly look at Americans’ trust in the nation’s financial system, measuring public opinion over three-month periods to track changes in attitude. Co-authors Paola Sapienza, professor of finance at the Kellogg School of Management at Northwestern University, and Luigi Zingales, professor of entrepreneurship and finance at the University of Chicago Booth School of Business, published today’s report as the tenth quarterly update. The latest issue looks at the period covering March 2011. The report finds a decline in trust across most of the components measured in the Index. Most notably, Sapienza and Zingales report a significant drop in trust in banks (to 32 percent from 43 percent) and mutual funds (to 25 percent from 31 percent). Trust in the stock market slid to 12 percent from 16 percent. 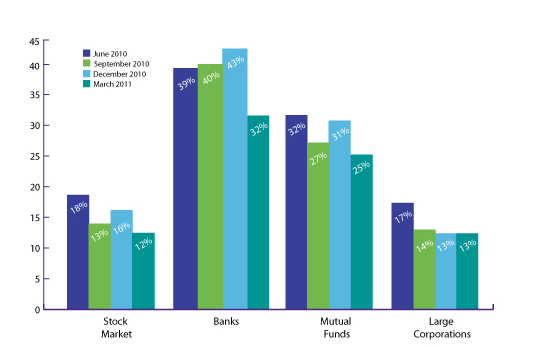 Percentage of people trusting various components that comprise the Financial Trust Index. Not surprising given overall trends, the latest data finds that Americans are also concerned that the stock market will drop by more than one-third in the next 12 months. 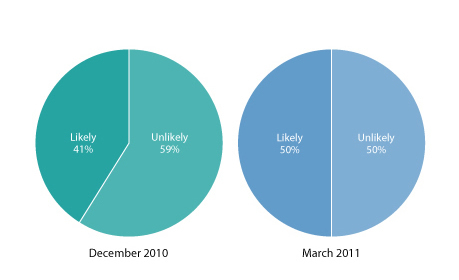 The perceived risk of a large drop in the stock market has increased about 10 percentage points since December 2010, with 50 percent of respondents believing it’s likely now. This wave of the Index also explored Americans’ attitudes toward homeownership. The researchers cited a decrease in strategic defaults among all states to 30 percent in March 2011from 37 percent in December 2010. “This change might be due to the increase in the perceived probability that a lender will go after a strategic defaulter,” said Sapienza. Respondents said they believe homeowners are choosing not to pay their mortgages because they are unemployed or underemployed (46 percent) or because they over borrowed (35 percent) due to the state of the economy. The economists also asked participants about their feelings toward recent news that some banks tried to issue foreclosures using false or faulty documentation. They found that 97 percent of respondents believe banks should pay a fine for this attempt. More than half of respondents preferred that fines paid by banks be given to struggling homeowners. On the other hand, survey participants said they were less in favor of bank fines being used to help homeowners who overborrowed. The percentage of Americans who are angry about the country’s current economic situation increased to 57 percent from 52 percent. The current figure is near the level reported during the beginning of the financial meltdown (60 percent in December 2008). 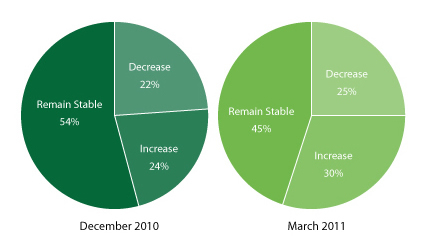 The latest report shows that perceptions of the real estate market have worsened. There was a spike in the percentage of people who think home prices will increase in their area (to 30 percent from 24 percent). At the same time there was a 9 percent decline in the percentage of people who think home prices in their area will remain stable (to 45 percent from 54 percent). ABOUT THE SURVEY: On a quarterly basis, the Financial Trust Index captures the amount of trust that Americans have in the institutions in which they can invest their money. The survey is conducted by Social Science Research Solutions (SSRS) using ICR/International Communications Research’s weekly telephone poll service. As part of the most recent wave, a total of 1,007 individuals were surveyed from March 16 to March 24, 2011. The institutions considered in the survey are banks, the stock market, mutual funds, and large corporations.